Nicephorus III Botaniates, Byzantine emperor from 1078 to 1081, belonged to a family which claimed descent from the Roman Fabii; he rose to be commander of the troops in Asia. 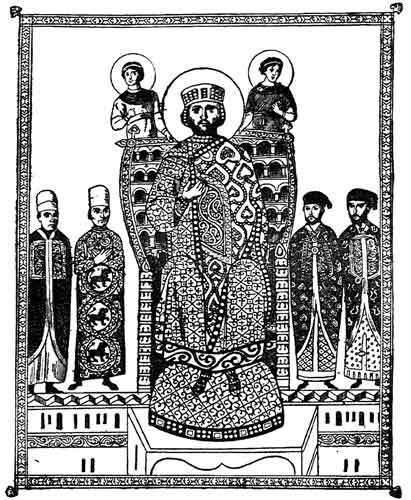 In 1078 he revolted against Michael VII, and with the connivance of the Seljuk Turks marched upon Nicaea, where he made himself emperor. In the face of another rebellious general, Nicephorus Bryennius, his election was ratified by the aristocracy and clergy. With the help of Alexius Comnenus, he drove Bryennius and other rivals out of the field, but failed to clear the invading Turks out of Asia Minor. Nicephorus ultimately quarrelled with Alexius, who used his influence with the army to depose the emperor and banish him to a monastery. In the years of his reign Nicephorus had entirely given himself over to debauchery. 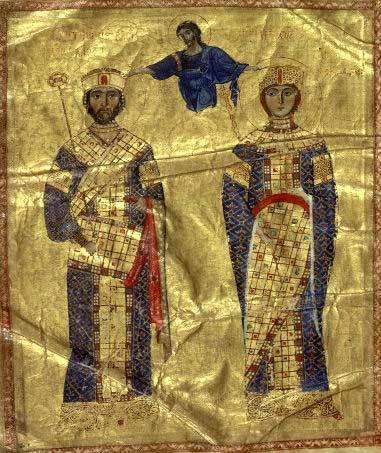 The Byzantine emperor Nicephorus III and Maria of Alania. Nicephorus III is also a fictional Byzantine Emperor ruling in the beginning of the XIV century in a Harry Turtledove's alternate history novel Agent of Byzantium.